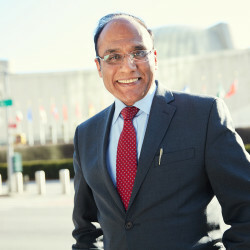 Twenty five years experience at senior level in international development the UN. Recognized as an innovative thought leader and agent of change, continually seeking to improve efficiency and foster collaborative and productive relationships with diverse teams at all levels of the United Nations. Having successfully completed the RC assessment, I have travelled extensively to all regions, and worked in complex settings involving multi-dimensional teams including national government and UNCT. Throughout these years, I was regularly engaged in negotiations and discussions with the UNFPA/UNDP Ex-Board delegates. I have been closely involved in the operationalization of Health Sector SWAP and SDGs for UNFPA. Most recently, served a lead consultant with UNFPA for a Comprehensive Resources Review driven by SDGs, for streamlining of functions for strengthened program delivery and operational effectiveness at the field level.